【Environment-friendly & Electricity-saving】These pebbles can\'t grow by themself. But after being exposed to daylight, these pebbles glow beautifully in the dark. Glow lasts approximately two to three hours after full sun exposure. No electricity is needed and pebbles can last for years being exposed outdoor. 【Natural & Safety 】Made from Resins, non-toxic & tasteless, non-radioactive; Premium-quality, 100% natural substrate adds fun and beauty to your indoor or outdoor environment. 【Versatility & Year-round Decoration】Whatever you would like to add some color to your garden patch this spring, decorate patio to fairy-tale world in Christmas holiday, or provide an unique environment for your finned friends, these glow stones are the best choice for you. Ideal for waterscape, landscape, potted plant. Lighting a pathway, driveway, flower bed, fish tank aquarium, or garden. 【Indoor Available】The luminous pebbles are also safe for indoor use, but make sure to get enough sunlight for them to really glow once the lights go off! The longer the exposure time, the longer the duration of the light. 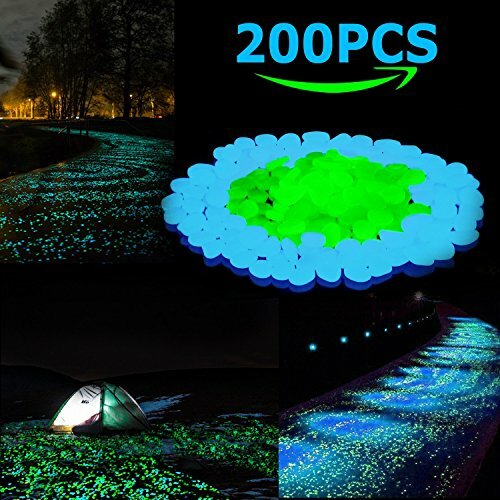 【Ample 200PCS】Package contains 100pcs in Blue & 100pcs in Green; Diameter: 0.8\"-1.2\"/ 2-3cm, may light an 80-120 inch pathway, use multiple packs for larger areas and check out with promo codes. More vibrant colors will be available soon.